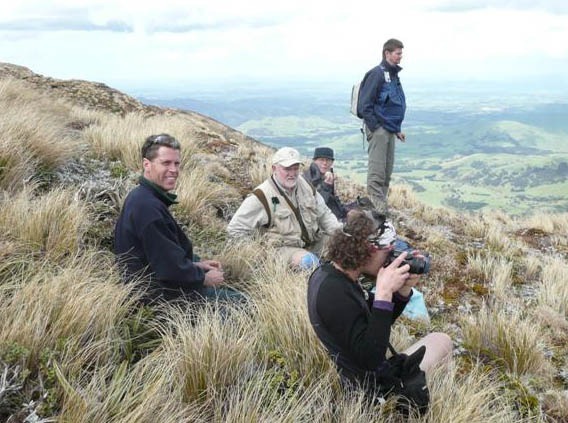 I’m just back from the John Child Bryophyte Workshop for 2009, which I helped organise (along with Massey University’s Lara Shepherd and Jill Rapson). The silver-tipped Campylopus introflexus is one of my favourite mosses. Photo by Leon Perrie, Curator. (c) Museum of New Zealand Te Papa Tongarewa. 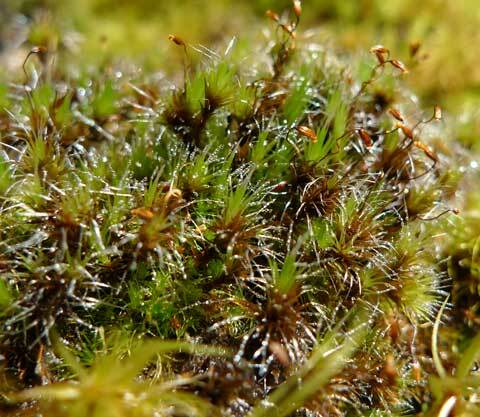 The Bryophyte Workshop studies mosses, liverworts, and hornworts, as well as lichens. Although often overlooked because of their small size, these plants are significant biodiversity and biomass components of many habitats. The 35 participants encompassed beginners to experts, amateurs to professionals, and came from all over New Zealand (plus Australia). Group photo for the 24th (2009) John Child Bryophyte Workshop. Photo by Terry Evans & Ross Beever. (c) Terry Evans, Auckland. We were based this year in the Hawke’s Bay at Waipukurau, with the excellent venue of Pukeora Estate. We collected samples from several nearby sites (with a permit from the Department of Conservation). 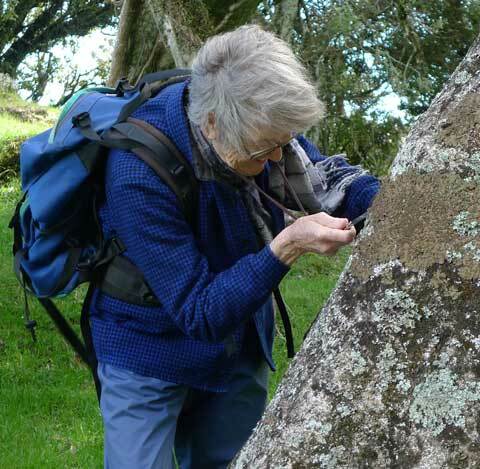 Barbara Polly, Te Papa Research Associate, inspecting the lichens on a tree trunk. Photo by Leon Perrie, Curator. (c) Museum of New Zealand Te Papa Tongarewa. 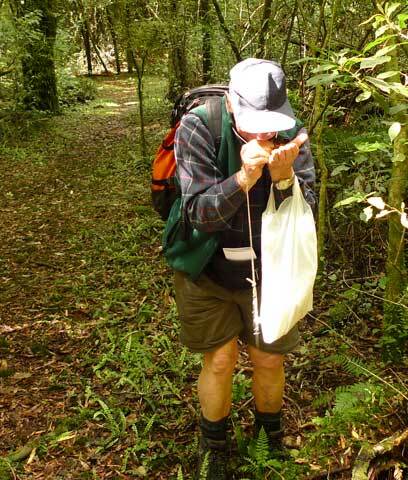 Peter Beveridge, Te Papa Research Associate, using a hand-lens to examine a moss sample. Photo by Leon Perrie, Curator. (c) Museum of New Zealand Te Papa Tongarewa. This rock was thoroughly inspected. Photo by Terry Evans. (c) Terry Evans, Auckland. Bryologists often move at a notoriously slow pace. However, these ones made it beyond Sunrise Hut (a climb of about 700m!). Photo by Antony Kusabs. (c) Antony Kusabs, Upper Hutt. 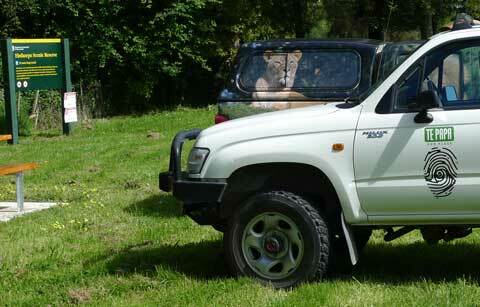 The lion-decorated 4WD used by the horticulturalists from Auckland Zoo added colour to our vehicle convoy. Photo by Leon Perrie, Curator. (c) Museum of New Zealand Te Papa Tongarewa. Once we had finished in the field, we returned to ‘base’ for a closer examination of the collected specimens. Many of these small plants cannot be identified precisely without the aid of a microscope. 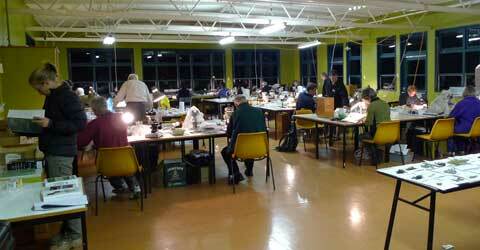 Identifying the day’s collections with the aid of microscopes and books. Photo by Leon Perrie, Curator. (c) Museum of New Zealand Te Papa Tongarewa. Display table in the microscope work-room, with specimens named to help beginners. Photo by Terry Evans. (c) Terry Evans, Auckland. Some of the specimens will be stored permanently in Te Papa’s herbarium (dried plant collection). 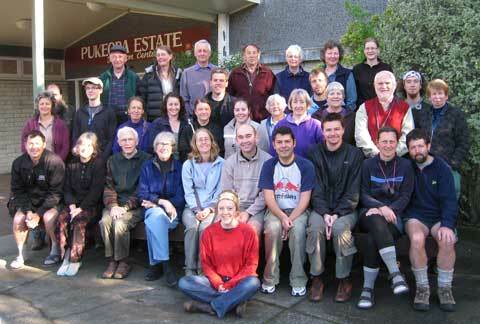 The 2011 Workshop is in the Waioeka Gorge, between Opotiki and Gisborne. It is in early December. Can you please email me (leonp@tepapa.govt.nz) and I’ll get you added to the mailing list and have the first circular sent to you. What are the details for the 2011 workshop? I’ll email you the latest information I have on the 2010 workshop. Delighted to find such a thing as a John Child Bryophyte workshop exists. I spent many childhood afternoons filing mosses and liverworts for my father… please tell me about any workshops down south. I want the articles and books on Liverworts and hornworts for my Ph.D.research work.I’ll give them back after their use. This comment had been held off by our word filter, sorry about that! I’ve added you to the Workshop’s email list. Expect the first circular describing the 2010 Workshop in the next few months. iam a Ph D scholar working on bryophytes in India. i would like to attend seminars and workshops on Bryophytes. please let me know more about the workshop and the next seminars or workshops. 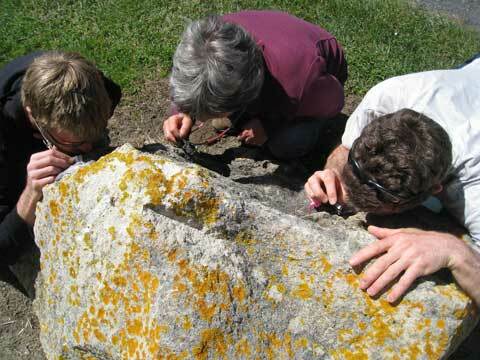 A John Child Bryophyte (& Lichen) Workshop is held almost every year. That for 2010 is planned for Southland’s Longwood Range. If you (or anyone else) would like to attend, let me know and I will pass your name on to the organisers. goood to know that a bryophyte workshop is conducted. please allow as much information regarding the bryophytes and their pictures so that everyone is aware f the little plants. me now doing Phd in Bryophyte diversity in India. please let me know more about the workshops.